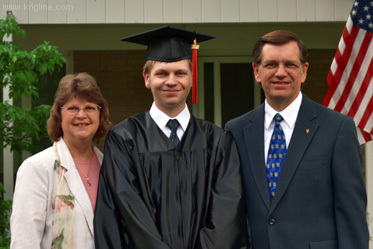 In 2010/11, we lived in Ohio, allowing Andrew to graduate from Michael's old high school: Hoover High. In 2011 he enrolled as a freshman at the University of Akron. We're very proud of him! 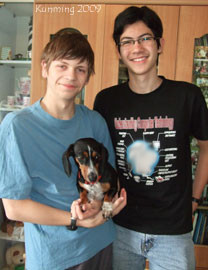 (Left, 2011) By Christmas of Andrew's freshmen year, we had endured months of separation (for the first time in our lives), so it was a great relief to be together again for a few wonderful weeks in Xiamen. 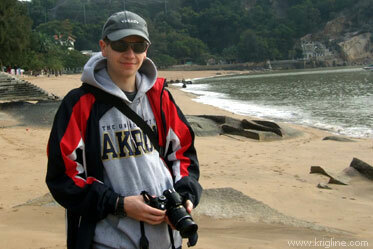 (This is actually on Gulangyu, and we also visited Volcano National Park.) We wouldn't get the chance to see him again until summer of 2013. (Below, 2012) Andrew is studying Design, and one class project required him to "creatively use" the "stitch" feature in Photoshop. 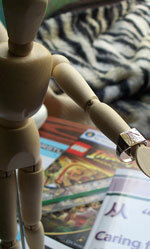 He shot photos of his many tasks on the college newspaper staff, and Vivian and I love the result! If there really were this many of Andrew (or of me), then maybe we could actually get the sleep our bodies need! When I put these two photos side-by-side I was amazed how easy it is to see the family resemblance! 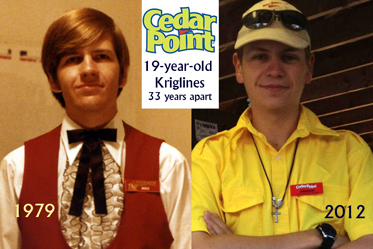 When I was 19 (1979), I worked at a large amusement park in Ohio called Cedar Point. 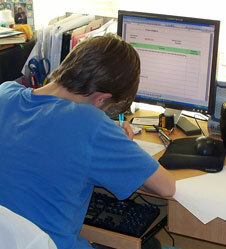 It is a good job for college students, so Andrew applied and got to work there too, when he was 19. His sister, however, trumped both of us, working at Disney World while she was in college! 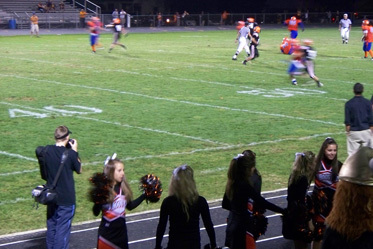 Andrew (bottom left) takes football photos for the high school newspaper, with cheerleaders, yelling fans and football players providing plenty of distraction (August 2010). He excelled as a Viking Views journalist, which (with high grades) helped him get into the Graphic Design program/Honors College at Akron U. During his sophomore year at AU he also joined the college newspaper staff. 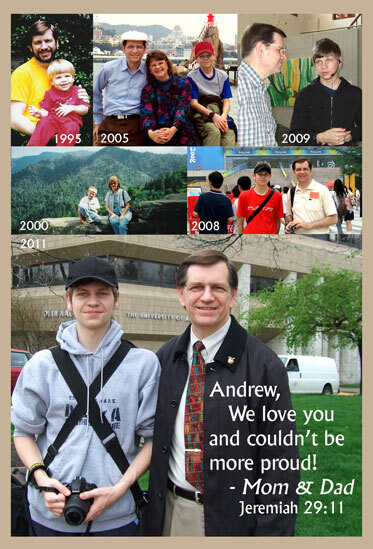 Michael created this montage, and paid for it to run in the last edition of his high school newspaper to "congratulate" Andrew just before his graduation.  The photos were taken in Columbia, Xiamen, Kunming, the Smoky Mountains, Beijing, and at Akron University. 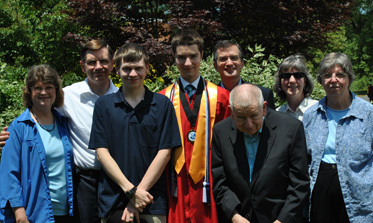 The culmination of more than twelve years of education was Andrew's high school graduation in June 2011. 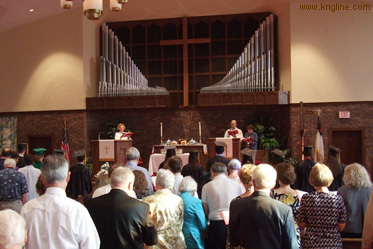 Graduation day began with a wonderful ceremony at church, wherein the leaders prayed for each graduating senior. 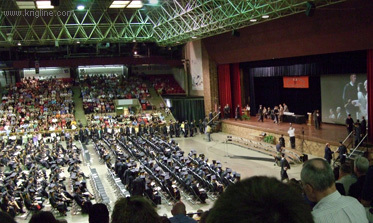 The main ceremony took place in the Canton Civic Center, which was big enough to accommodate all 300 graduates and their cheering relatives/friends. 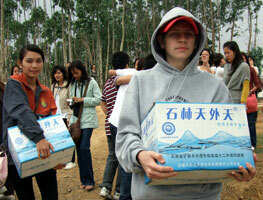 In this June 2010 photo, you see Andrew delivering crates of water to an elementary school affected by the worst drought in Yunnan for decades. 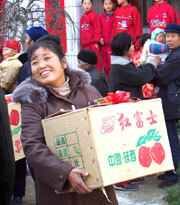 (The bus couldn't navigate on the narrow country lane, so we had to carry the crates a few hundred meters to the school). 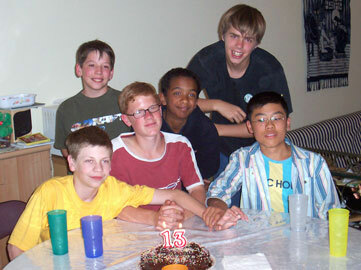 (right) Andrew was "home schooled" in 2009-2010 because the Kunming International Academy drastically raised its fees (higher than Michael's salary!). Here, he takes a test at Vivian's computer. He did exceptionally well on his US College Entrance Exam, which helped him get a tuition reduction when he enrolled at the University of Akron in 2011. 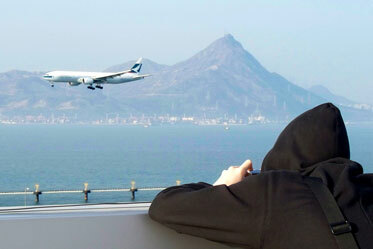 This photo is in Hong Kong (Feb 2009). I call it "Mount Hood." (Andrew likes to wear a hood all winter.) Vivian was in meetings, so "the boys" spent a day enjoying sunshine and games in and near the International Airport. "Terminal 2" has an interesting (though expensive) array of things for visitors to do. 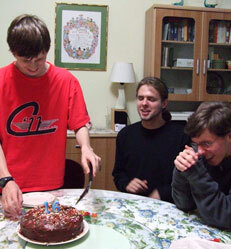 In 2008, Andrew said he wanted to help teach the little kids at our church (for foreigners), so for over two years (about every other month) Michael taught and Andrew helped. 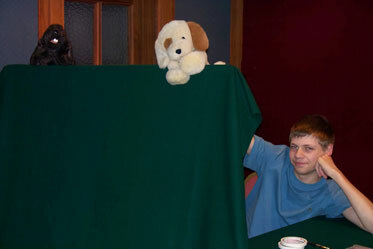 One thing the kids seemed to really like was our puppet shows. Andrew was the wise dog Shou-Ou and Michael was Denali, a playful beaver. April is birthday month for both Andrew and Beth, so this next section features photos from several of Andrew's birthday parties. 2010. Andrew was being Home Schooled his last year in China, so this BD was a quiet affair with only his good friend Nolan there to share the cupcakes. One of Gimli's peculiarities was an extreme dislike for leather--and she could smell it through packaging! As I recall, we went to Pizza Hut as usual, but found that they no longer sold pepperoni pizzas! Fortunately, Papa John's had recently opened a store in Kunming, and we found America's favorite topping there. 2011. In America, someone's 18th birthday is a "big deal" because now you are "an adult." Thus, you're old enough to vote, work full time, and be legally independent in every way. 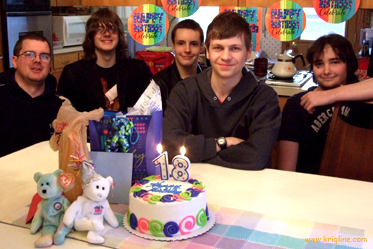 Some friends gathered during Spring Break to celebrate this momentous occasion (in Michael's parents' home in Ohio--the last birthday we would get to spend together since he soon went off to college). We also went out and played laser tag. 2009. 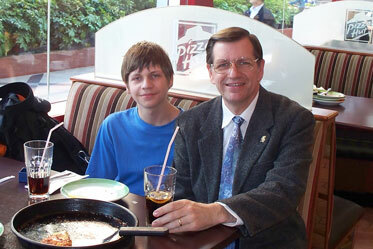 (Left) Andrew and Michael enjoy a father-son dinner at Pizza Hut to celebrate Andrew's 16th birthday. (center) At dinner, Michael surprised Andrew with this "Promise Ring," specially made to feature a logo Andrew had designed for himself. The things in the photo include a pose-able "guy" Andrew has been using to refine his artistic skills, and a book cover he helped to design. Two friends from school also spent Friday night at our place, watching movies and playing games to the wee hours of Saturday (this has become a birthday tradition). 2007. Four guys could make it this year. 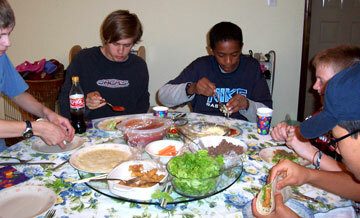 They started by devouring the Tacos Vivian had prepared. The theme was "Star Wars," but they ended up watching all three Lord of the Rings films before everyone was asleep. Late on the first night of this BD gathering, the guys played a game Andrew and Michael created for the party. We called it Farse Wars; there are three levels, and we created farcical photos and a bizarre story as the backdrop of the game. The Lego pieces go with each warrior's identity, including "Yo-dog"--a combination of our puppy and Yoda. Everyone had a lot of fun! 2006. 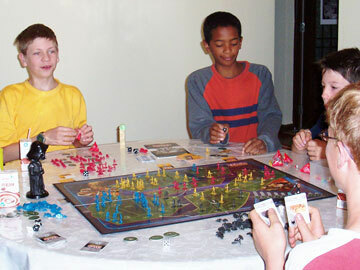 A big crowd was on hand for Star Wars Risk this year's birthday party. 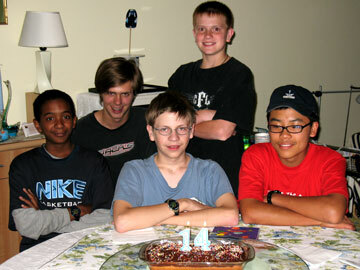 Compare this photo to his 14th-16th birthdays and you'll see few consistent faces (only one, to be precise). Such coming and going is common among the international community, which can make it difficult for kids to enjoy the long-term friendships they would have in the country of their birth. Of course, they also have lots of experiences (like climbing the Great Wall, visiting Hong Kong Disneyland/Scotland/etc) that most kids could never dream of! 2004. Andrew got to spend half of 2004 in an American school (the only time he did that, other than first grade). 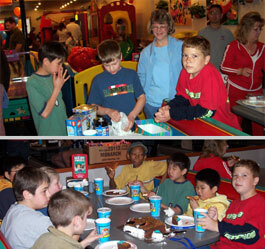 (Left) Classmates and friends-of-the-family went to a Kids' Pizza restaurant for his 12th birthday party. (Center) His sister Beth made a cool cake for the event. 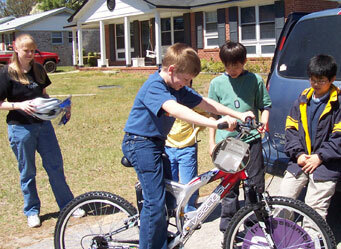 (Right) Friends from our home church (yes, they are American-Chinese) gave Andrew "the coolest bike he ever owned"--making this birthday extra memorable. 2005. 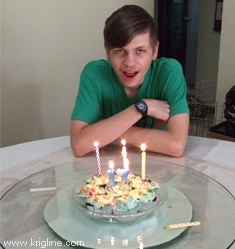 I can't find a photo of his 12th birthday party, but this was taken about two weeks later (April 15, with Vivian at a park in Xi'an). 2003. 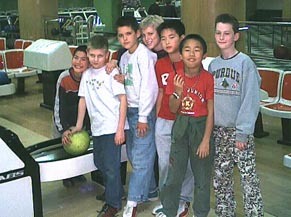 Andrew and friends, bowling at his 10th birthday party (in Xi'an). 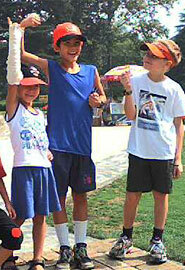 The annual Jian Hua conference (this one was in Hong Kong, 2005) gives Andrew the chance to be with other kids his age who are also experiencing the challenges of growing up in a second culture. Some of these kids live in Kunming, so he already knew some people when we moved there. 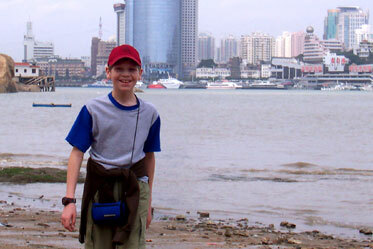 Andrew has skipped stones in the South China Sea (here we are on Gulangyu island with Xiamen in the background--Feb. 2005), the Pacific Ocean, the Atlantic Ocean, the Yangtze River and the Yellow River, not to mention assorted lakes and rivers around the world. 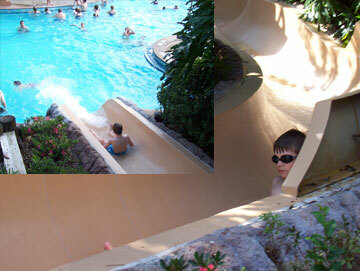 During our 2004 stay in the USA, Andrew went swimming a lot, mostly under the watchful eye of his Grandma Krigline (who took these photos). Virtual twins. 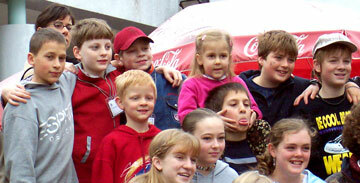 (Left--2002) This may have been the first time Andrew met the Elner's kids, but he and Pierce (a fellow JHF kid) were destined to become "best friends." For the three years that we lived in Xi'an, they enjoyed spending as much time together as their parents allowed (we didn't live nearby). 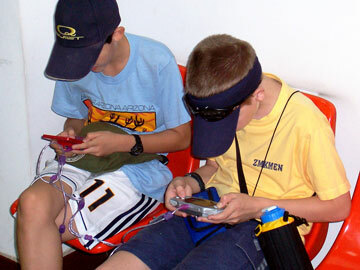 (Center--2005) Here they use linked Gameboys while their parents did "boring" things. Great friends are worth keeping, so they've even gotten together a few times since we moved to Kunming (Right--2009 with Gimli). Christmas in the Country. 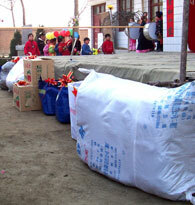 A highlight of 2004 was the chance to share Christmas with this school in Weinan, a village near Xi'an. The school had been damaged in a recent flood. The boxes and bags in this first picture contain a new backpack for each student, along with school supplies, balls, rackets, paddles and other sports equipment. In the middle picture, a grateful school principal is carrying one of the boxes inside. 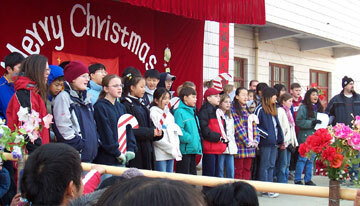 On the right, Andrew is in the middle as his schoolmates and teachers sing some Christmas carols to the gathered crowd. Andrew's headmaster also presented candy canes to all of the local students, and explained the symbolism behind this American holiday treat. School Days. 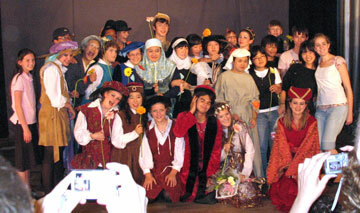 (Left) This is Andrew's whole class (2004-05) at the Xi'an International School on "Culture Day"--they represented Canada. 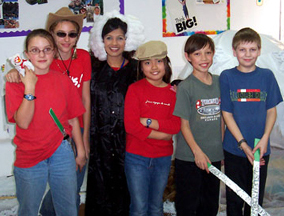 The teacher is dressed as a judge, while Andrew, Micah and Hope (far left) are the "Three Musketeers of the Sea." 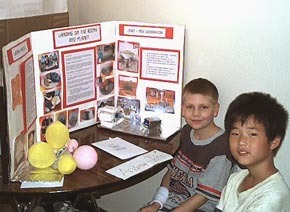 (Center) Andrew and John won first prize for their grade at the school science fair (May 2003). They were studying how the NASA rover will land on Mars. 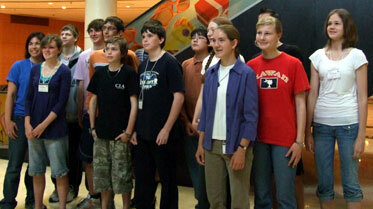 Andrew's entry on Tsunamis took second place in 2005. 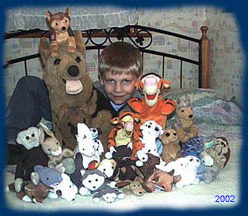 (Right) Even back in 2002, Andrew also had quite a collection of dogs (and other Beanie Babies/animals), though now they simply reside in plastic sleeves behind his door. Hobbies change as you grow up. 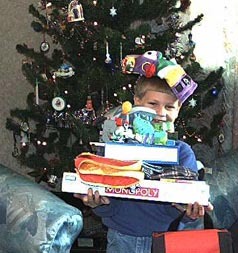 We shipped Lego from the US in 2000, and that was Andrew's favorite toy for years (as it was Michael's). He used to read a lot, but in his teen years Andrew's hobbies switched to computer games and graphic art software, and taking care of Gimli. Andrew got an award for being the "hardest worker" on the backstage crew for KIA's spring 2007 drama night, called A Window on Comedy and Tragedy. It included three one-act plays that all had a window in them. He was also active "back stage" in his high school's plays. Backstage: "What can I do next?" 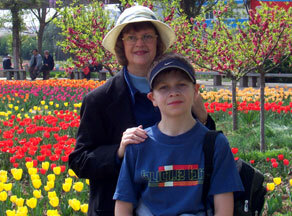 Finally, the "embarrassing" photos of his early childhood, that I like too much to delete from this page. (Left-2000) Andrew had a great First Christmas in China. The tree was a gift from a British teacher who left soon after we arrived in Shanghai. (click here for other Christmas photos). The next photo shows a Greek warrior who showed up in our kitchen one spring morning (2001). He said something about a school project, but frankly it was all Greek to me! 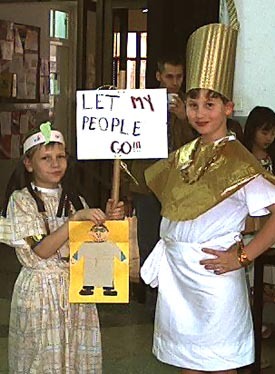 The next year he was trying to convince Pharaoh to let his people go! Unfortunately, Pharaoh wouldn't listen, even with "Flat Aaron-Stanley" there to help! His drama career continued the next year (2003) in Xi'an, when he was Christopher Columbus. I think it was the next year that his teacher convinced him to be "Uncle Yule" in a Christmas play, and he hated it so much that he never acted again. 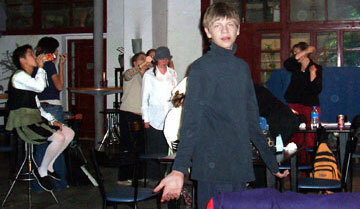 In high school, however, he played a "leading role" in the back-stage crew for several school plays. When Andrew was little, Chinese people loved watching him and having a photo taken together. That is one thing Andrew certainly didn't miss as he grew older!